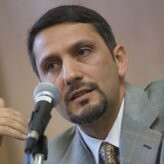 Hatem Bazian (Ph.D, Philosophy and Islamic Studies, UC Berkeley) teaches AAS 128AC: Islam in America: Communities and Institutions and AAS 132: De-Constructing Islamophobia and Othering of Islam. He will offer AAS 128AC during the summer session in 2011. In Spring 2009, he founded the Center for the Study and Documentation of Islamophobia, a campus research unit dedicated to the systematic study of Othering Islam and Muslims. Dr. Bazian is also a co-founder of Zaytuna College of California, the first Muslim Liberal Arts College in America. As a graduate student, he was an important student leader in the movement for more fairness and better educational opportunities for African American and Latino students at Berkeley.